Thanksgiving jokes for a heaping helping of humor. You can consume all the short clean jokes and funny quotations you want. They won't stick to your thighs or put you to sleep. Links to more Turkey Day Humor at the bottom. The father says, “We’ve had enough. We’re getting tired of the same old routine and looking at each other every day. And I don’t want to talk about it, so call your brother in Detroit and let him know.” And the line goes dead. Panicked, the daughter phones her brother and drops the bomb. Here’s a killer turkey recipe, with a foolproof self-timer. It’s impossible to mess this up. You’ll get a perfectly cooked turkey every time. Fill the turkey’s cavity with the mixture. Lay the turkey in a greased roasting pan. Insert the turkey into the oven, with the neck pointing inward. This is very important. Do not concern yourself with roasting time. When the turkey’s rear end blows the door off the oven, it’s done. Vegetables are a must on a diet. I suggest pumpkin pie, zucchini bread, and carrot cake. I hope I don't get mashed potatoes and gravy on my phone again this year. 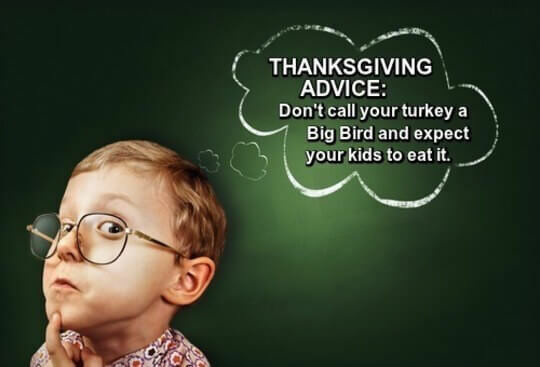 Most turkeys taste better the day after. My mother's tasted better the day before. Americans observe Thanksgiving very much as the pilgrims did in 1621, by pepper-spraying each other at malls. Gearing up for shopping tomorrow. Just knocked my grandma to the ground. Just thought of a plan that would combine the best elements of pie with the best elements of TV. My plan is to eat pie while watching TV. I celebrated Thanksgiving in an old fashioned way. I invited all my neighbors to my house. We had an enormous feast. Then I killed them and took their land. It's Thanksgiving, or as the Pilgrims called it, Occupy Someone Else's Country. Not only did Brenda tell us how much more she likes dark meat today, my father in law informed us that of all wild game, he prefers beaver. Thanksgiving dinners take 18 hours to prepare. They are consumed in 12 minutes. Football halftimes last 12 minutes. This is not coincidence. It’s great that my mother-in-law volunteered to cook Thanksgiving dinner for the needy this year. You’d have to be needy to want to eat her cooking. Thanksgiving is watching my mother-in-law polishing off a quart of Boone's Farm and watching Gunsmoke on Netflix. Or go back from "Thanksgiving Jokes" to "Anniversary Jokes"